We are all familiar with public utilities. 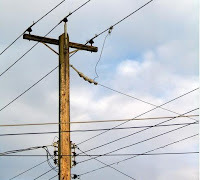 Electricity, water, sewer, telephone, natural gas are all metered services that we can connect into for a monthly fee. We are charged only for what we consume. That is the key. We never have to buy more than we need, which makes it an ideal billing structure for us. It is economical and our behavior allows us to control our costs. If the electric bill was too high last month, start turning off lights and other appliances. Our behavior determines our costs. Under the last computing paradigm, if you wanted large computational or storage capacity, you had to spend a fortune in hardware and software systems to provide these services for yourself. That meant you needed a dedicated server room with proper climate control to preserve the equipment. You needed a full time computer technician to monitor, maintain and manage these expensive computers that provided you with the services you needed. These systems were cumbersome, expensive and required constant care and supervision. But all that changed with high speed Internet connections. You don't need expensive equipment anymore. All you need is to identify your specific needs You might need more storage space, spare computational capacity or even remote PC maintenance. Once your needs are identified, you simply find a vendor online that provides these services for you. You get all the benefits from the services rendered and they get to leverage their investments in equipment and personnel to serve you. Before you needed to spend a fortune equipping your business with all the technology you needed to run. Now you can purchase the services you need, and just what you need for a fixed monthly fee. Like a public utility, computing has become a fixed-fee, managed service that saves you from spending unnecessarily. You don't have to spend money on equipment and employees that do not contribute directly to your bottom line. You can spend your precious money on sales, marketing and other areas that bring in profits. For more info, sign up for our FREE 5-week "Nearly Free IT" e-Course.